With FRED 2006 now up and running, I thought I’d give some background to some of the 36+ projects going on. Starting with the Boar beside Wild Boar Fell. 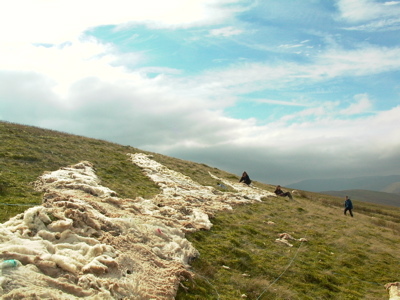 over 500 fleeces, mostly swaledale, were used to create the hill drawing. On the Wednesday a team of volunteers from Blackburn aided artist Jan Hicks and fellow FRED artists Helen Fletcher and Steve Messam to get the bulk of the laying out done. Jan had previously marked out a grid of 4 metre squares in blue bailer twine. The fleece was pegged into the ground with bamboo pegs and willow withies. A couple of Llamas helped transport the fleece up the 50 minute hike to the site, the rest being brought up by quad-bike and trailer. The piece was completed by Jan and Helen the following day. The piece is best viewed in the afternoon when the sun picks up the white fleeces and it positively glows. The best view is obtained by walking up the path to Wild Boar Fell from the Tommy Road. After only 15 minutes walk, the Boar really starts to loom large above. At 120 metres across, the Wild Boar is only the second largest hill drawing in the UK (after the Whipsnade Lion).